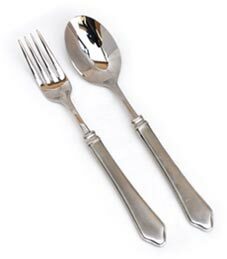 To set the flatware: cutlery is used according to the rules of logic, that is, the pieces furthest away from the plate are used first. 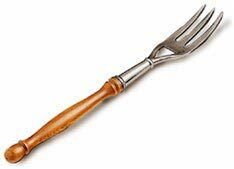 Forks are placed to the left of the plate with the prongs pointing away from the diner, while knives go to the right: if there is both a fish course and a meat course two knives must be used, bearing in mind that fish is always served before meat. The cutting edge of the blade generally faces the plate; the same applies for the dessert knife which is located above the plate with the handle pointing towards the right. 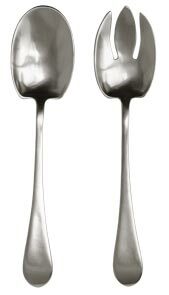 The dessert fork or spoon is placed above the knife with the handle pointing towards the left. 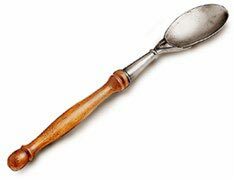 Some schools of thought hold that if waiters are serving at the table, it is not necessary to set the dessert cutlery as this will be brought by the waiters at the right moment. The pewter handles of our flatware set are made using a special technique: the molten pewter is directly cast onto the steel tips of the cutlery so as to create highly resistant objects. 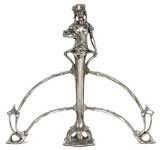 This process forms what is really a single element in which the "hardness" of the steel discreetly dissolves into the "soft" surface of the pewter handle, more suitable for contact with the hands.